TIME, TIDE & TREACLE TART! There was a time when the tiny Suﬀolk coastal village of Dunwich was one of the ten largest towns in England. A wealthy ﬁshing port with at least 18 ecclesiastical buildings the loss of more than half of Dunwich’s taxable land, disappearing into the sea between 1066 and 1086, is recorded in the Domesday Book. What remains of the hamlet though is, in my opinion, very special. Regular readers of our magazine will know that we’re keen dog walkers and the coast, woodland and heath paths around Dunwich are unparalleled for their sheer natural beauty, they keep pulling us back time and time again. The long shingle beach, desolate and bracing through the colder months bustles with families as soon as the sun appears and paddling becomes a must. I particularly enjoy walking through Dingle Marsh; we’ve taken the path through the marshes all the way up the coast to Walberwick and Southwold beyond, but you don’t have to be an ‘outdoor type’ to ﬁnd a reason to visit Dunwich. Because even if there wasn’t a beach, even if the heath didn’t subtly change with every phase of the heather and even if the village wasn’t steeped in history the village pub alone is reason enough. Once the haunt of Smugglers and only a stone’s throw from the aforementioned beach The Ship is, quite simply, a great pub. The ﬂagstones of the entrance hall, worn to a shine by the footsteps of hundreds of years, lead you through the charming, higgledy building. Full of cosy corners the bar has a very traditional feel - complete wood-burning stove for colder days. There’s a comfortable family friendly lounge and a light and airy conservatory with enclosed (part covered) courtyard beyond before you venture into the enormous garden with its historic ﬁg tree. Though the dog friendly bar is usually our favourite spot we decided that as on this occasion we were visiting for an evening meal, sans Darcy, we’d choose a table in the conservatory. 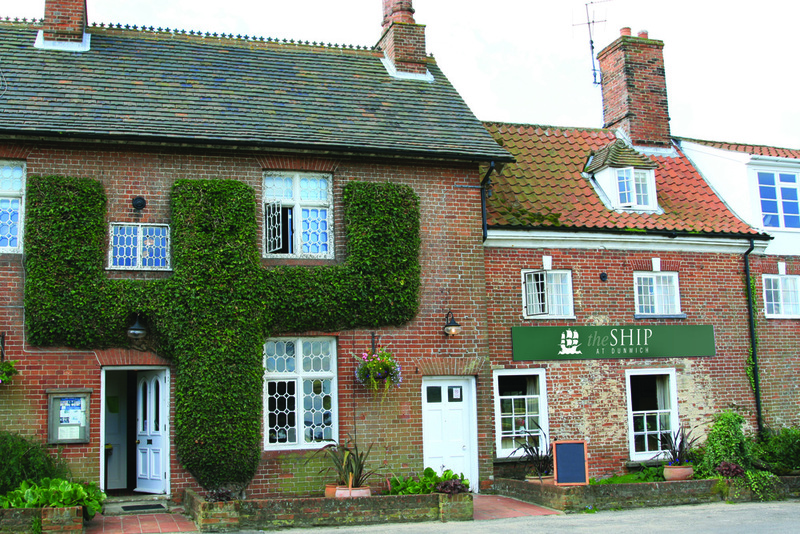 The team at The Ship are always welcoming and Kim’s sunny smile was at its usual full volume as she oﬀered us menus and reminded us of the specials on the blackboards in the bar so we wandered through to check out the choices and order our drinks. Manager Matt Goodwin likes to keep a rolling programme of guest beers in stock for his patrons but there’s always Adnams on tap and refreshing Calvors lager too. I’ve found a great new use for my mobile phone - photographing the specials boards if it’s out of view of your table so that you can check through the choices side by side with the printed menu. I know it’s only a little thing but if you’re as indecisive a diner as me you’ll be chuﬀed with that tip! The team of chefs at The Ship have come up with a very enticing menu and one dish that will always be on oﬀer is their famous ﬁsh & chips – with the usual trilogy of cod, haddock or plaice available. My husband had already decided that he couldn’t visit without choosing the ﬁsh even though main courses of slow cooked aromatic Blythburgh belly pork with date and apple puree or beef, mushroom and baby onion pie complete with herb mash both came very close to swaying his intentions. The starter was a slightly more tricky – whether to go for English cheese and ale fondue with homemade seeded puﬀ pastry sticks? Or should it be the twice baked Stilton souﬄé with roasted walnuts, port poached pear and endive salad. These were two rather hard to resist cheesy choices but resist he did and instead enjoyed a seriously scrumptious Scotch egg of Blythburgh pork and black pudding served with The Ship’s own piccalilli. We ﬁnd it intriguing how a dish can go through all the various processes involved in creating a Scotch egg and the yolk still stay perfectly on the soft side of hard-boiled. My starter was, for once, an easy one for me to decide on. I absolutely love smoked mackerel pate and the thought of it served with golden dill soldiers and cucumber relish had me salivating just at the description. Coarse, meaty, ﬂavoursome…a great balance was created with the crispy, crunch of the herby toasts. I’d choose it as a light lunch too, heartily recommended. But what to follow with? As it was a Sunday I felt drawn to the slow-cooked leg of Suﬀolk lamb and I’m glad I stuck to my guns. I’m sure I’d have been equally happy with a dish of smoked haddock, leek and barley risotto from among the specials and judging from the delightful squeal of ‘delicious duck Mummy’ from a young diner on a nearby table the twice cooked crispy duck leg with home- made plumb jam glaze was clearly going down well but my lamb, served very cleverly alongside its own shepherd’s pie with carrot & swede mash and braised red cabbage among other vegetables fell apart at the gentlest of touch from the fork - perfect. We’re never ones to shy away from the dessert menu on a day with a ‘y’ in and The Ship really hits the mark with traditional desserts. There’s always a good selection of ice creams, sorbets and a well thought out cheeseboard but when the list of puds includes Old English treacle tart, creamy vanilla rice pudding with homemade jam, the rather special sticky toﬀee pudding that you may remember we featured as the Chef’s Recipe in the April edition of Places & Faces plus pear and frangipane tart it makes me feel glad that custard was ever created! Treacle tart is my Dad’s absolute favourite and on the pretext of sampling it to be sure I could recommend it to him my order was placed. Keeping it in the family, as such, Adrian chose to measure the rice pudding against treasured memories of his Granny’s own recipe, a tough ask I’m sure, but of course The Ship exceeded even his expectations. It’s on such evenings that I often wish I’d booked an over-night stay. After a comfortably ﬁlling meal whiling away the rest of the evening with a glass or two of a favourite beverage in the bar would have gone down well, but the thought of that treat on a return visit is one to savour.